Another rainy weekend. I'm trying not to jump the gun and rush into spring plantings. That pesky groundhog predicted six more weeks of winter, but mother nature has been teasing me with seventy degree days and spring breezes. Trees are beginning to bud, and many of my flowers are making their way toward bloom time. Today will consist of some yard work, but first, my adorable kiddos have asked me to make homemade muffins for breakfast. I'm not a great baker. In fact, I consistently make mistakes when following recipes for baked goods. I have yet to make a good biscuit (my mother-in-law thinks my PH balance has something to do with it). Chemistry aside, I usually leave the baking to my husband. Baking is in his blood, as his grandparents owned a bakery for many years, where his mom and dad were also employed. No one makes better muffins than grandma, but when the kids ask oh, so sweetly, I can't resist the look in their longing eyes. I use a tried and true recipe for Banana Chocolate Chip Muffins. It starts with a plain muffin batter, and then the bananas and chocolate chips are added in at the end. The banana makes the muffins really moist. The trick is to make sure the bananas are truly overripe- the mushier, the better! *We make our own vanilla using whole vanilla beans and vodka. So easy to do & tastes so much better than what you buy in the store! Grease your muffin tin. 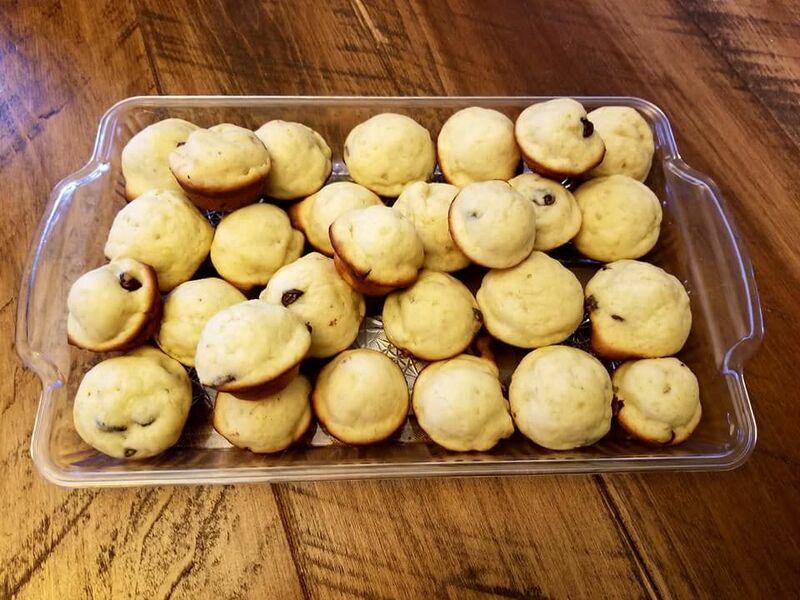 I used a mini muffin tin to make smaller muffins for my kids. Peel and mush bananas in a mixing bowl. Add the melte butter and stir together. Make sure the mixture is smooth and not chunky. Add sugar, egg, and vanilla. Mix until combined. Stir in salt and baking soda. Add in flour and chocolate chips. Do not over-mix! Divide into muffin tins. For mini muffins, bake at 400 degrees for 8-10 minutes. For large muffins, bake at 350 18-20 minutes. 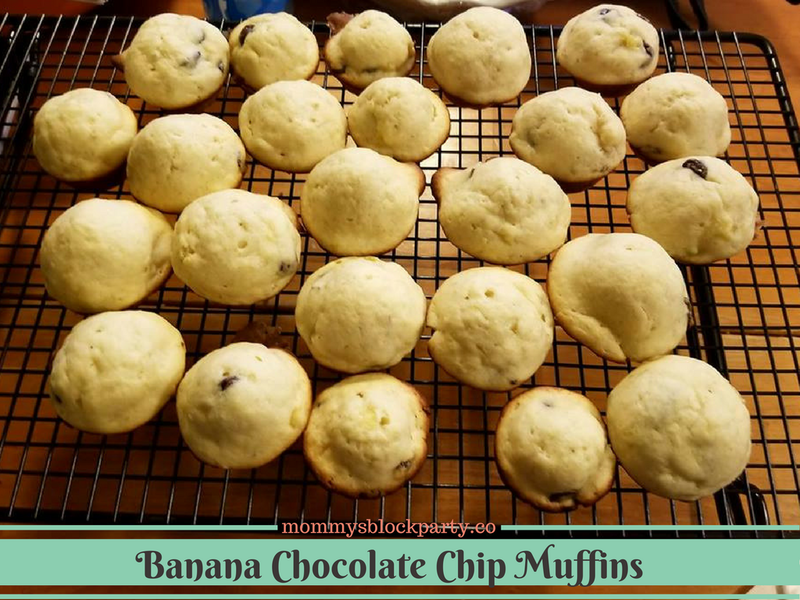 These Banana Chocolate Chip Muffins are so moist and delicious! They're incredibly easy to make, and I guarantee that they won't last long once you make them! These are perfect to 'make and take' to work, to a brunch, or just to have to tuck into lunchboxes or grab for quick breakfasts. 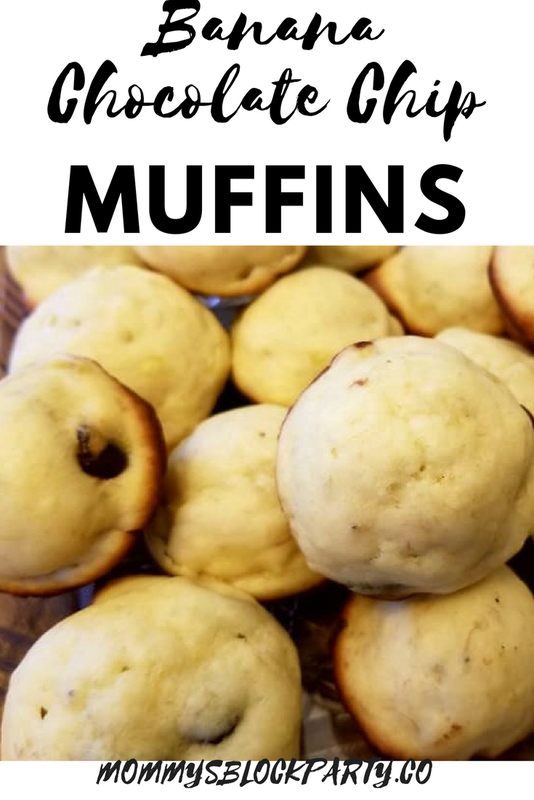 What are your favorite types of muffins? Be sure to tell me in the comments, and if you happen to try this recipe, I'd love to hear what you thought of it! Don't forget to pin this one for later!